Doors by continuing the word and gospels of Jim Morrison, Ray Manzarek, Robbie Krieger and John Densmore.” – Pure Magazine, Ireland. The band re-create the sound, look, presence and magic of a real 1960’s Doors concert, perfectly and effortlessly transporting the audience back in time with classic hits such as ‘Light My Fire’, ‘When The Music’s Over, Riders On The Storm, The End and many more. 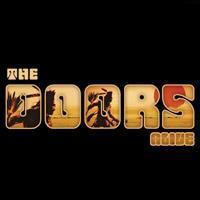 The Doors Alive have over 1,000 shows under their belt to date.